Progress, apparently, smells a lot like dead fish. Just ask anybody near the site of the "Olympic Lagoon" in Rio de Janeiro. Brazilian officials have been quick to blame recent rain water, which they say caused the water temperature to change drastically. 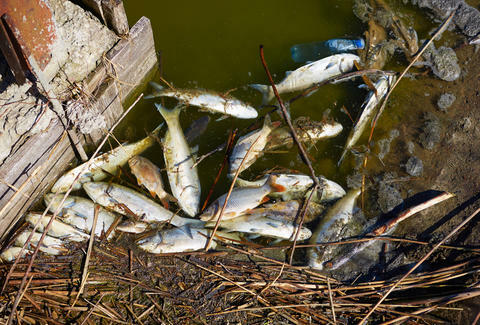 They believe this phenomenon and the increase in decaying matter in the waters changed oxygen levels, leading to the death of many innocent fish. However, the State Environmental Institute and the Secretariat of State for the Environment are doing further testing. Because blaming this many fish deaths on rainwater sounds like something out of the Old Testament, rather than an actual scientific statement. The bay, unsurprisingly, has a history of pollution. CNN reports that just last year, biologists announced that rivers leading into the bay were filled with a superbacteria known to cause urinary, gastrointestinal and pulmonary infections. Sounds like a great place to go for a dip... if you think the East River is a little too clean. While the fish deaths are one concern, athletes will be traversing these waters in a little over a year. Perhaps hazmats suits will be the new Olympic uniform in 2016.